Lookeen - The award-winning Windows Desktop and Outlook search! 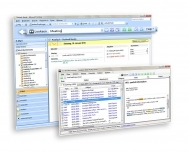 Find files and emails in record time and with maximum reliability. The data you are looking for can be found at any time, thanks to real-time indexing. Lookeen searches all desktop and network files and Exchange Server data (such as, emails, contacts, appointments, tasks, PST archives, and Public Folders) as well as local Outlook files. Lookeen finds keywords in PDFs and can handle all common file formats (.xlsx, .pptx, .docx, .php, .jpg, .html, etc.). Rollout Lookeen company-wide with the integrated group policies (starting at Lookeen Business Edition) and browse external indexes (Lookeen Enterprise Edition only). Lookeen is compatible with virtual desktop environments (VDI) like Citrix and VMware. The simple operation and intelligent search filters help you to easily search large amounts of data. IncrediMail to PST Converter is an efficient tool to convert incredimail to PST files of Ms Outlook 2010, 2007, 2003. Use incredimail to pst converter to convert incredimail email including attachments.